Slider Initializes a new instance of the Slider class. IsDirectionReversed Gets or sets a value that indicates the direction of increasing value. IsFocused Gets a value indicating whether the slider control has focus. Orientation Gets or sets the orientation of a Slider. IsDirectionReversedProperty Identifies the IsDirectionReversed dependency property. A Slider control lets users select a value from a range of values. 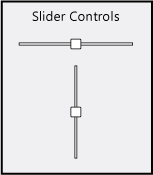 The following image shows horizontal and vertical slider controls. The orientation of the Slider, either horizontal or vertical with the Orientation property. The direction of increasing value along the Slider with the IsDirectionReversed property. The range of the Slider using the Minimum and Maximum properties. The current position of the thumb using the Value property. You can handle the ValueChanged event to perform an action when the slider value is changed by the user. Due to the precedence of how dependency properties are set, if the Value property of the Slider is animated, the user may no longer be able set it when the animation finishes. For more information, see Dependency Property Value Precedence. For a list of the initial property values for an instance of the Slider class, see the Slider() constructor. To apply the same property settings to multiple Slider controls, use the Style property. To change the visual structure and visual behavior of a Slider, copy and modify its default style and template. For more information, see Control Customization. Dependency properties for this control might be set by the default style of the control. If a dependency property for a Slider is set by its default style, the property might change from its default value when the Slider appears in the application. For more information, see Dependency Property Value Precedence. You can get the default style and template for Slider from Slider Styles and Templates. Setting a visual property will only have an effect if that property is both present in Slider control's default template and is set by using a TemplateBinding. You can find a list of visual properties in the "Changing the Visual Structure of a Control" section of Customizing the Appearance of an Existing Control by Using a ControlTemplate. The following code example shows several slider controls and how to handle the ValueChanged event.